The best time to visit Colorado’s mountain towns is arguably spring: the season of fresh, lively, new beginnings. The year’s second season marks the end of the coldest days and sparks a feeling of renewal. 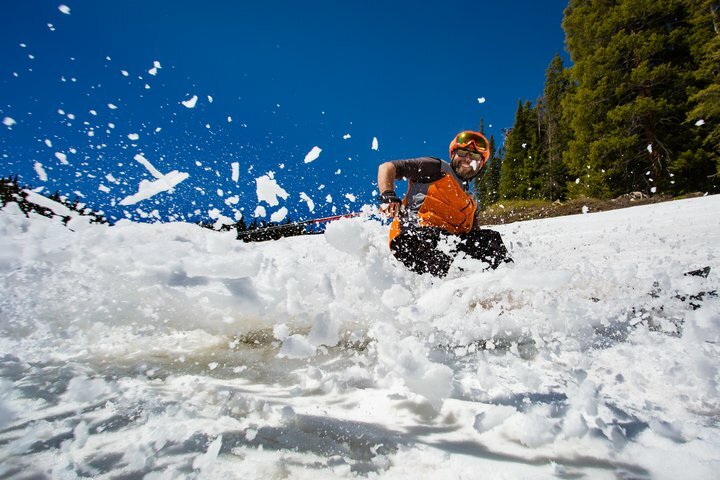 Summer is on the horizon—but ski turns on corn, slush, or powder are yet to be indulged. The transition is simply sweet, from the sun warming the soil to the birds’ songs in the trees. As to be expected, Aspen locals know how to celebrate spring to the fullest with huge parties, complete recoveries, and all the adventure in between. Here’s a snapshot of all to look forward to for your visit to Aspen in April. If you’ve never experienced late spring skiing, you may not know what you’re missing. Spring skiing is especially enjoyable for beginners or those wanting to take easy turns. The days are warm, the snow is soft, and the lift lines are fast. Not the mention you have the opportunity to cruise down Aspen Mountain on wide-open runs and get seated first at Ajax Tavern. Keep up with Aspen Mountain’s potential spring weekend dates on the Aspen Snowmass Facebook page. If we get spring now, you’ll be the first to know. Bacon Appreciation Day: that’s correct. In celebration of Buttermilk’s closing day, the mountain hosts an annual bash featuring all-things bacon. First, join (or applaud) skiers in the “Fueled by Bacon Sizzle Up” uphilling event from the base to the Cliffhouse. Prizes include Best Costume, the Center Cut (for the middle-of-the-pack person), and fastest family. Earn a second breakfast or save room for the bacon waffles at the summit! All day, grab bacon samplers around the mountain between ski laps. When the lifts shut down, the fun doesn’t stop: head over to Bumps restaurant for a bacon-and-beer happy hour including the Aspen Skiing Company Bartenders Brawl, a competition to create the best bacon-inspired libation. Sunday, April 8, 8 a.m.-until the bacon runs out. La Ultima Fiesta is a party not to be missed. The annual closing day of Aspen Mountain is an après-style fiesta held at Ajax Tavern including the live jams of Cabo, Mexico-based Mala Rumba: two guitarists, a drummer, and flutist who blend modern and classic flamenco, Mexican fare from Chef Matt Zubrod and drink specials reminiscent of the beach. Sunday, April 15, 2-6 p.m.
Who says open bodies of water and winter sports don’t go hand in hand? Bring a courageous squad for the 10th annual Schneetag (pronounced Sch-knee Tog), which is held on Snowmass’ closing day. Four-member teams create a craft—any vessel made out of any materials—that they steer down the slopes and skid across a 20-by-50-foot pond. As if that’s not a great enough challenge, groups also incorporate a theme and perform a skit before they take off down the mountain. Traveling solo? Independent snowboarders and skiers are invited to pond skim between team runs—they even can potentially win a prize if the judges are entertained! Sunday, April 15, 1-3 p.m.
As the earth reawakens, so does the body. Heal yourself and support your well being at The Little Nell’s Health Center, especially if you are recovering from the bacon festivities or the pond skim! Make time for a solo strength training session or a cardio workout. Detoxify in the steam room. Top off the therapeutic day with a scheduled you-date: a facial or massage. If you’re interested in yoga and meditation—or a high-intensity interval training class and “thug” yoga—check out the menu of classes offered at Aspen Shakti. If the low altitude snow is sparse in April, celebrate with a spring hike. Our favorite is the Smuggler Mountain hike, walkable from downtown Aspen. For a paved route, walk, run, or bike along the Rio Grande Trail. It goes all the way to neighboring Basalt and makes a perfect afternoon sweat session. Throughout spring, countless events dazzle the Roaring Fork Valley from live music at the Belly Up to history-indulging walking tours led by the Aspen Historical Society and visiting film festivals. Everyone is welcome to join the fun including furry friends and blossoming families. The possibilities are truly endless and, in spring fashion, the excitement for the year is just getting started. Colorado Residents: Travel to Aspen in spring and get a special resident rate at The Little Nell. Please note, The Little Nell closes for spring from April 16 – May 21 to refresh and recharge for summer.